Beef bone broth is a wholesome, nutrient-dense food you can add to your current lifestyle. Beef bone broth may help to support immune function, digestive health, and may even help to support strong muscles. Unfortunately, the majority of beef stock, chicken stock, and beef soups you’ll find on grocery store shelves lack these vital properties. Real bone broth has an incredibly long cooking time — soup bones or marrow bones are simmered on low heat for 24 hours. Below, you’ll learn more about the unique nutrient profile of beef bone broth, how to get more bone broth in your diet, and how to make it at home. Above all else, this is what bone broth — whether it’s chicken broth, beef broth, or another variation — is known for. 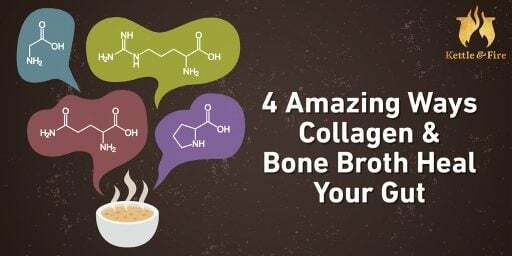 The reason you were fed chicken soup as a sick child is because broth (real broth, that is) contains collagen, which may help to support gut health. Your gut — which, even if you’re a size six, covers roughly 200 square meters — is where you come into the most contact with the outside world (i.e. bacteria, mold, chemicals, and viruses). It’s also packed with the largest number of immune cells, with the purpose of preventing the growth of viruses or bacteria that cause disease (4)(5). The lining of your gut can be compromised by several factors: antibiotics, environmental factors, antacids, alcohol, and processed food — all of which were on the rise in the second half of the last century (6)(7). When your gut becomes permeable, this is called leaky gut syndrome. The cracks or holes in your digestive tract allow partially digested food and toxins to penetrate the tissues beneath it, causing changes in the bacteria in your gut. This, in turn, can cause a number of digestive issues and chronic disease (8). Bone broth may help t0 support your digestive tract by closing the holes in your stomach lining. It has become extremely popular among the paleo and AIP (autoimmune protocol) communities and others looking to support their bodies through food. Beef bone broth doesn’t just help to support your digestive tract. It contains nutrients that may help build and repair muscle tissue, the immune system, tendons, and bones. Amino acids are the building blocks of protein, allowing the body to build muscle, burn fat, and recover after a workout — and beef broth contains many of them (9). Beef broth contains all nine essential amino acids, those that can’t be made by the body and must be consumed through food. Proline is an amino acid that helps stimulate muscle growth and strengthens your joints, tendons, and heart muscles (10)(11). Glycine helps maintain muscle mass, prevent the loss of cartilage, and improve athletic performance (12). Beef broth contains collagen, often referred to as the “glue” that holds your body together. Collagen is found naturally in humans and animals, making up your tendons, joints, skin, and cartilage. Collagen’s amino acid profile is special because of proline, glycine, glutamine, and arginine – four important amino acids. These particular amino acids have been shown to enhance the immune function of your intestines and reduce inflammation (13). There are three different types of collagen: Type I, Type II, and Type III. While all three types are found in bone broth, beef bone broth is highest in Type I. Type I collagen is found in your tendons and ligaments, helping to connect muscle to bone. Type I collagen has the incredible ability to stretch without being broken — allowing you to jump, run, and play sports without having your muscles literally tear from the bone. Actually, gram from gram, it’s stronger than steel (1). If you’re reading this thinking, “Well, this is all well and good…but how do I consume it?” you came to the right place. A hot cup of broth in the morning (rather than your typical mug of coffee) is the ultimate comfort food, and an easy way to get more broth in your diet. However, if you’re not ready to drink bone broth straight, here are a few delicious recipes to start with. 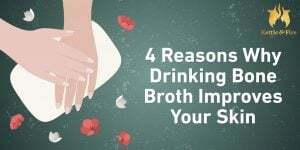 Note: You can substitute beef broth for virtually any recipe calling for chicken broth or stock, including vegetable soup, beef stew, chicken noodle soup, vegetable beef soup, or other beef soup recipe. This is one hearty soup recipe you can feel great about enjoying. Fingerling potatoes are combined with half a head of cauliflower the bring the carb count down from a typical potato soup, and there’s no dairy in the ingredients. Rarely (if ever) will you find a bone broth hummus that contains fats, vitamins, and amino acids. Simply allow the garbanzo beans to simmer in beef bone broth until it has been mostly absorbed. Then combine all remaining ingredients in the food processor for a light Mediterranean appetizer. This gluten-free pho is just as delicious as any pho you try at a Vietnamese restaurant. Plus, it’s an incredibly easy recipe to make, taking just five minutes to prepare and 30 to cook over medium-high heat to bring out the unique Asian flavors. This beef ragu uses beef bone broth in the sauce for extra gut support. The Italian seasoning, garlic cloves, ground beef, and diced tomatoes gives you that same rich tomato base you’d expect, but substituting spaghetti squash for pasta cuts the carb count down considerably. This mocktail is the perfect drink to enjoy as a post-workout drink or an on-the-go beverage. With beef bone broth, coconut oil, and cayenne pepper for a little kick, it offers many important nutrients. This is our tried and true beef bone broth recipe that you can make at home! 4 pounds mixed beef bones marrow bones, oxtail, knuckles, short rib, etc. Spread the mixed bones on a baking tray in a single layer and place it into the oven. Roast the bones for 30 minutes. Flip bones and roast another 30 minutes. Cook on low for 24 hours. Add water as needed to keep all the ingredients covered in water, and periodically skim the foam off the top of the pot. After 24 hours, the broth should be a dark brown color. Strain the broth through a fine mesh strainer and discard the bones, vegetables and bay leaf. Before storing, pour into separate containers and cool to room temperature. Once cooled, chill in the refrigerator for 1-2 hours. Skim off the accumulated fat at the top of the container, if there’s any. Store in the fridge for up to a week or in the freezer for up to 3 months.